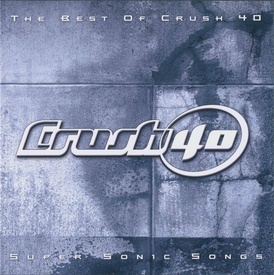 The Best of Crush 40: Super Sonic Songs is the third album by the Sega-affiliated rock group Crush 40. Included are tracks from their previous album, along with a selection of Sonic the Hedgehog-related songs, many of which have been re-mixed specifically for this compilation. Brand new to this release is a cover of the theme to Sonic Riders: Zero Gravity, a cover of the song "Fire Woman" originally done by the British band The Cult, and "Is It You," an original Crush 40 composition not written for a video game. The album was also released as a digital download on iTunes and Amazon, with three extra bonus tracks which have been published on other physical releases through Wave Master. Individual tracks cost ¥150, US$0.99, £0.79 or €0.99. Johnny would like to thank all of the "Crushers" who year after year support Crush40 and all of the Sega teams involved in making great games and great music! Special thanks to the Senoue family for treating me so awesome! And to my family....it goes without saying...I love you all. Brandon wants it louder! Katy wants it lower! What the heck?! Go to you rooms........and play CRUSH40! Jun would like to thank... Chieko, Juri, Joshua and rest of my family. Naofumi Hataya and everyone at Sega sound team. All the development teams at Sega I had worked with. Special thanks to the Gioeli family, you guys are so sweet! And all out friends and fans! Love ya! This page was last edited on 8 October 2018, at 21:29.